Need a Pond Filter System that doesn't cost the earth? Welcome to the PowerBee Range of Pond Filter Sets, Simple Effective Filtering for Healthy Ponds and Fish, from All in One Solutions to Separate Pumps & Filters in a set, choose the one to suite your pond size. 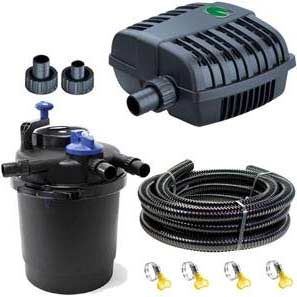 Make Filtering Your Pond simple with our complete Pond Filter Systems, Everything You need is included. It can sometimes be daunting to know which Filtration system fits Your Pond, we have wrapped up Pumps and Matching Filters perfectly matched together, You just need to choose one to fit the size of your Pond. Please see on each product we have added... 'Ideal for Ponds up to x litres', so just figure out your Pond size and select the System that suits your needs.